Grudge Match, a film about two geriatric boxers striving for personal glory in a world that has given up on them. 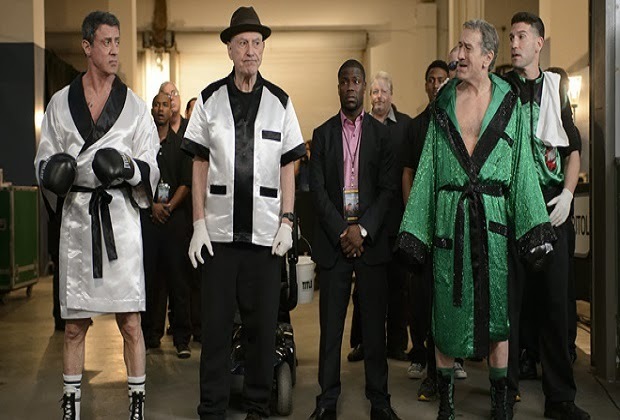 Starring Sylvester Stallone and Robert De Niro this film centres around a fanboys dream. What if Rocky Balboa went up against Jake Lamotta? Who would win? Who would lose and most importantly, would we(the audience) care? Grudge Match has a lot going for it, a decent cast, an(almost) original plot and decent talent behind the camera, Peter Segal(Get Smart). Razor and Kid(Stallone and De Niro respectively) are two washed up boxers, each living their lives the best way they know how. Razor is working at a factory having lost all his winnings due to some swindling and bad money management(Rocky 4 anyone? ), Kid owns a bar and a car dealership but you can tell that he will never let go of the loss that he suffered at the hands of Razor all those years ago. Both men are living in the past albeit in very different ways, Razor is trying to forget while Kid is desperately holding on. Events take place and both men are offered the chance to settle the score once and for all, to decide which of the two of them is the greater boxer and during the course of the film they both learn what it means to move on from the mistakes they made in the past all the while preparing for this event that will mean closure for the both of them. One of the weirder and funnier moments. I'm unsure about this film. There were moments where I was genuinely interested with what happened to these two guys and the circle of friends and family they have surrounded themselves with. BJ(Jon Bernthal) is a wonderful character who has some great scenes with Kid. They bounce off each other fantastically and you can feel an actual warmth growing as the film progresses, this can be said the same between Razor and Lightning(Alan Arkin) who have this wonderful chemistry due to their long standing friendship. There's some good humour peppered throughout the film and each character is given enough time and fairness to him so that neither comes off as an antagonist or a protagonist(you may argue that Razor is a more likeable character and though at times this can be true he has as many flaws as Kid). The problem with Grudge Match is funnily enough the Grudge Match, not nearly as interesting as it should have been and the ending is so full of sporting film cliches that it would make the Rocky film blush. In the end I enjoyed this film, it's okay not great, not bad just okay and Stallone does not deserve a Razzy for this performance. So I'll finish with the immortal words of Henry "Razor" Sharp, "it's not the best but it's the best we got".